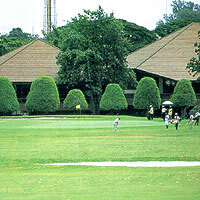 Although the Royal Hua Hin Golf Club opened in 1924, major renovations were carried out in the 1980's that have brought the club up to its present day standards. A round here is truly an unforgettable experience as players are continually faced with majestic views of the Gulf of Thailand. The par three 14th is one to behold, for a beautiful Thai temple forms a picture-worthy background. Testament to the club's age, and the Asia of the period that the club was built in, is the sight of the old Hua Hin, Bangkok-Singapore railway station which lies adjacent to the clubhouse, contributing an air of elegance to the course. One of Thailand's gems is just a stone's throw from the centre of town. Cross the railway line at the station and you can walk on to the first tee. It's a classic example of a natural golf course, set in undulating terrain around impressive limestone scarpments. The fairways are lined with mature trees making shot accuracy the key to a good round. Several holes provide panoramic views of the Gulf of Thailand. There are no water hazards, though monkeys have been known to make off with golf balls placed close to the jungle on several of the holes on the back nine.